In the film, The Best Man, written by Gore Vidal, a candidate for president, Joe Cantwell (Cliff Robertson), is arguing with his more principled opponent, William Russell (Henry Fonda). Exasperated at one point, Cantwell says to Russell, “I don’t understand you”. Russell responds, “I know you don’t. Because you have no sense of responsibility towards anyone or anything. And that is a tragedy in a man, and a disaster in a president”. The Best Man first appeared as a play in 1960. The film was released in 1964. More than five decades later, our newly-elected 45th President, Donald J. Trump, may be the disaster Gore Vidal warned us about. Check the record. Start with Trump’s campaign comment on John McCain (pictured above). Rebecca Gordon. the author of American Nuremberg: The U.S. Officials Who Should Stand Trial for Post-9/11 War Crimes, teaches in the philosophy department at the University of San Francisco. She has a more nuanced approach to our newly-elected president. In her essay, “Life Under Trump”, for TomDispatch.com, she shared stories from her classroom the week Trump was elected. She reminded her students that Trump voters included a sizable portion of our population which feels maginalized and denigrated by our present public policies. In due time, many of those Trump voters may find they have been conned by a master con artist who told them what they wanted to hear. Cons most often lead to disaster. Our media was complicit in Trump’s election, treating his race as a daily horse race with winners and losers. What the media failed to do was to examine seriously the nature of the candidate who won the final race. In President-elect Trump’s meeting with The New York Times editorial board, he continued that con. And the Times did what media leaders do, they dutifully reported what he said, even as they certainly knew this is a man who says whatever he feels the audience in the room wants him to say. “Tempered”, “dropped”, “expressed doubt”, are the wrong words to use when reporting on Trump. He said what he said in that given moment because he knew the editorial board members wanted to hear that his campaign rhetoric was subject to change in their direction. I found the ideal way to understand the Trump phenomenon in an Atlantic article by Salena Zito, published September 23, during his campaign against Hillary Clinton. In her Atlantic article, “Taking Trump Seriously, Not Literally”, Zito wrote of Trump’s visit “to a shale-industry gathering”, where he “found a welcoming crowd”. At one point, Trump promised the shale-industry executives that he had a plan to benefit their industry. The Bureau of Labor Statistics puts the unemployment rate for blacks between the ages of 16 and 24 at 20.6 percent. Trump prefers to use its employment-population ratio, a figure that shows only 41.5 percent of blacks in that age bracket are working. But that means he includes full time high-school and college students among the jobless. Professor Gordon takes Trump seriously in her TomDispatch essay. What she hears and sees concerns her deeply. In Donald Trump, we have a president-elect who has said he will simply ignore the law if it gets in his way. In a primary debate last March, he insisted that the military would follow any order he gave — whether to torture detainees or to “take out” the families of suspected terrorists. When debate moderator Bret Baier pointed out that soldiers are prohibited from obeying an illegal order, Trump answered, “They won’t refuse. They’re not gonna refuse me. Believe me. I’m a leader. Walking back was a standard tactic for Trump as a candidate. Walking back will be a “disaster” for his presidency. When Trump tweets or speaks on matters that reflect his non-Aquinas understanding of the law, he speaks of himself alone, the man voters have now elevated to the presidency. Think back, pilgrims, to what Trump said about torture in one campaign debate: “They won’t refuse. They’re not gonna refuse me. Believe me. I’m a leader”. The Los Angeles Times, reporting on the Times meeting, wrote that Trump “backed off on his commitment to torturing enemies of state, saying a single conversation with a retired Marine general changed his mind”. In another significant turnabout, he backpedaled from his repeated calls for a return to waterboarding and other discredited torture techniques to fight terrorism. Trump indicated he had reversed his view after a discussion with retired Marine Gen. James Mattis, considered a possible pick for secretary of Defense. “He said, ‘I’ve never found it to be useful,’” Trump said of their conversation on torture. Trump said Mattis explained his view, shared by experts, that proven methods of interrogation, including building a relationship between interviewer and suspect, yield more useful information. “Give me a pack of cigarettes and a couple of beers and I’ll do better,” Mattis said, according to Trump, who said he was “very impressed” with the answer. Donald Trump appears to change his mind according to the latest person who gains his attention. He insulted a U.S. 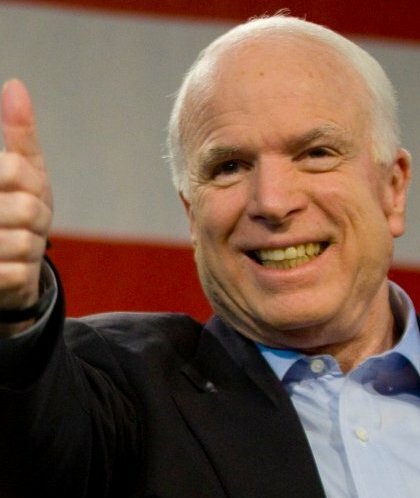 Senator by saying he does like “prisoners”, and he displayed no interest in the 5 and a half-years John McCain spent in a North Vietnamese prison. But a general, who talks tough, turned him around with one comment against torture. Barring an impeachment, Donald Trump will be our president for the next four years. The media will cover him in detail. It is time for media and the public to take what our President-elect says, very seriously. Once he assumes the power the voters have given him, both the media and the public must respond wisely and forcefully. The picture above of then-presidential candidate John McCain in 2008 is a Getty image by Darren Hauck. This entry was posted in -Movies and politics, Donald Trump, Media, Politics and Elections. Bookmark the permalink. What have you heard/what do you think about Trump’s son-in-law’s solving the Israel/Palestinian Problem??? I voted for Trump. I am not an illiterate blue collar worker, in fact I am a successful business-type with degrees from Yale and Harvard. I could not vote for HRC because she is responsible for the deaths of millions in the Middle East and her top five donors were Jews who wanted her to do more of the same. Trump may turn out to be a worse choice like Obama, but I will keep voting for change until we get it right. We should not be lectured on how we voted by party-line Democrats who failed their moral duty to vet their candidate, for which they owe us all an honest apology, because they let us all down. Trump’s message at Thanksgiving in 2016 is as noble as Washington’s proclamation on Thanksgiving in 1789, both of which should be read at the table this year. Every pundit has underestimated Trump from the beginning and at every stage to the present moment. Taking this example as guidance, I predict that Trump will be an excellent President. He will surprise us again. I propose that the discussion now return to failure of American foreign policy in the Middle East, which urgently should be discussed, and has caused this forum to be distinguished. For real, Jack Graham, Trump an excellent President? I am appalled at every selection that he has made.